Similar unit to our Compress Air Vibration Isolation Table Stand except is designed for those facilities that do not have compressed air available in the workplace. The vibration isolation canisters provide convenience as well as isolation. They inflate with a hand or bicycle pump and are available for weights up to 4800 lbs. Our stock canisters are available in 100 lb or 300 lb versions (click here for spec sheets) but others are obtainable. Each stand uses (4) canister units. Mounted to rail of Table Stand. Multiple units can be purchased. Step3 : Table dimensions. 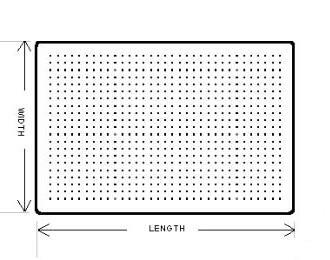 This is the actual outside dimension (length / width) of your Breadboard / Table Top. 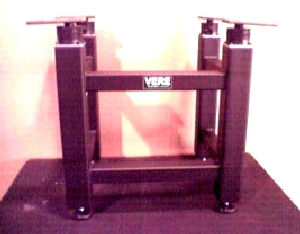 A Non-Compressed Air Table Stand using VIC1a Canisters supporting a 24” x 36” Breadboard with a weight limit of 400 lbs total.